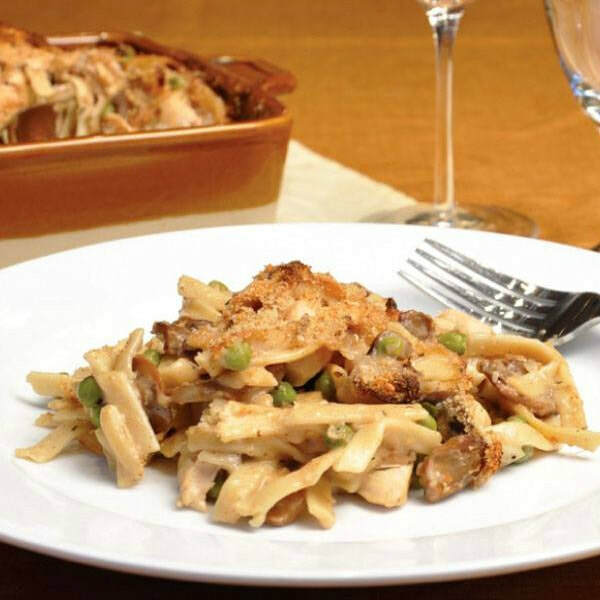 This rich and creamy Turkey Tetrazzini is a dish your family will love. It is a perfect way to use leftover turkey or chicken. Try adding more vegetables to make it even healthier! Preheat oven to 400°F. Lightly grease a 9x9-inch baking dish. Cook pasta in a large pot according to package instructions. Remove from heat and drain 2 minutes early. While pasta is cooking, melt butter in a saucepan over medium heat. Add the mushrooms and thyme. Stir and cook until mushrooms are softened, about 5 minutes. Stir in ⅓ cup of flour until well blended. Add the rest if needed to thicken. While whisking, slowly add chicken broth and milk. Bring to a boil, reduce heat, and simmer until sauce is thickened and smooth, about 5 minutes. Add turkey, frozen peas, and cooked pasta. Gently mix together. Pour into the baking dish and sprinkle with Parmesan cheese. Bake until the sauce is bubbling and the cheese is golden brown, 15-25 minutes. Let cool for 15 minutes before serving.